In 1995 there were no nationally recognized amateur skate contests. Then Tampa Am happened. After year one as a mostly local event, the second Tampa Am quickly became a phenomenon. Today if a skater refers to “The Am,” everyone knows what they’re talking about. In its 25-year history Tampa Am has become the international proving ground for premier amateurs from around the world. So many winners of the early Ams went on to turn pro that landing on top of the podium there eventually came to guarantee a career in skateboarding. The list of Am winners, which includes Donny Barley [’96], Caswell Berry [’02], Nyjah Huston [’05], and Luan Oliveira [’08 AND ’09], is a who’s who of some of the greatest legends of our time. Today Tampa Am is an institution that’s accepted as the Amateur National Championship. As the level of skating continues to rise, so does Tampa Am’s reputation as the most important contest in skateboarding. Skatepark of Tampa is dedicated to making Tampa Am accessible to the most diverse collection of skaters possible from throughout the world, both male and female. In order to provide that opportunity for the unknown or up and coming ams, while also ensuring that the most well known and established ams are recognized, we've instituted a two-tiered qualification system in 2016, with a Last Chance Open on Friday, and the official Tampa Am Qualifier on Saturday. Different criteria (with some overlap) determine who skates each day. Judging has elements of the objective and the subjective. Tampa Am uses a five-judge panel of skaters that have deep roots and the respect of the skateboarding industry. Many of our judges are former pros. Judges assign scores based on the following factors: difficulty of tricks, style, technique, variety of tricks, use of course, flow, consistency, originality, and whatever else a skater can bring to their run. The high and low scores are dropped with the remaining three judges’ scores are averaged to determine a final score on a 100-point scale. 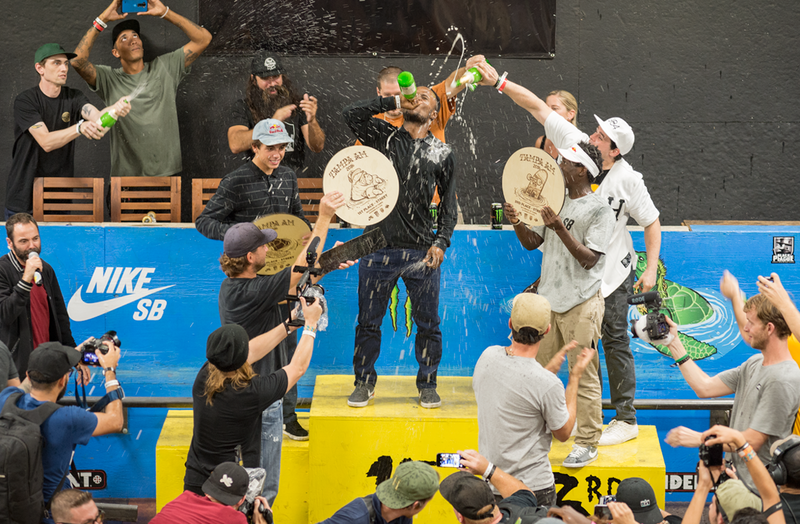 In addition to the winner being known by every skater, TM, and brand manager in the world, they will also get the distinction of being included alongside Nyjah Huston, Felipe Gustavo, Trevor Colden and other legends on the list of all time winners. Buy tickets and watch live inside the Skatepark of Tampa. Check out our SPoT Life edits each day of the event on the Skatepark of Tampa YouTube channel. Look for photos and video clips dropping each day on the @SPoTTampa IG along with Facebook, and right here on our site.